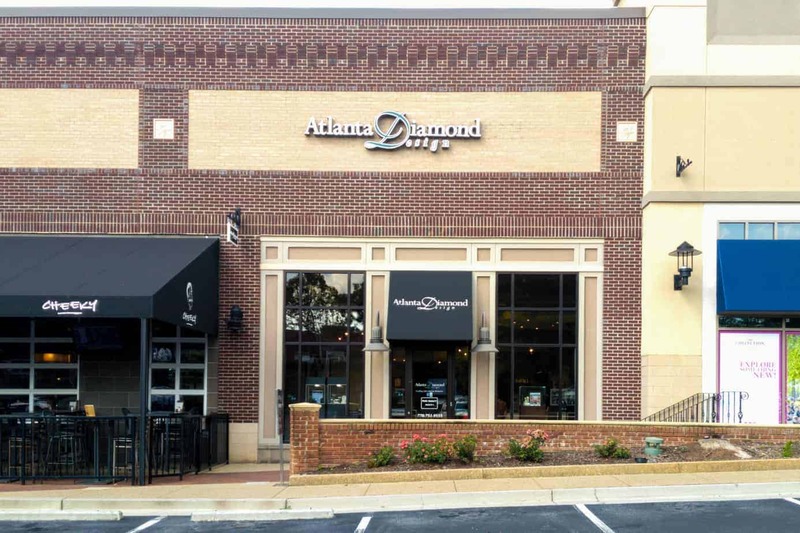 Atlanta Diamond Design has always been a premiere custom design jewelry store. 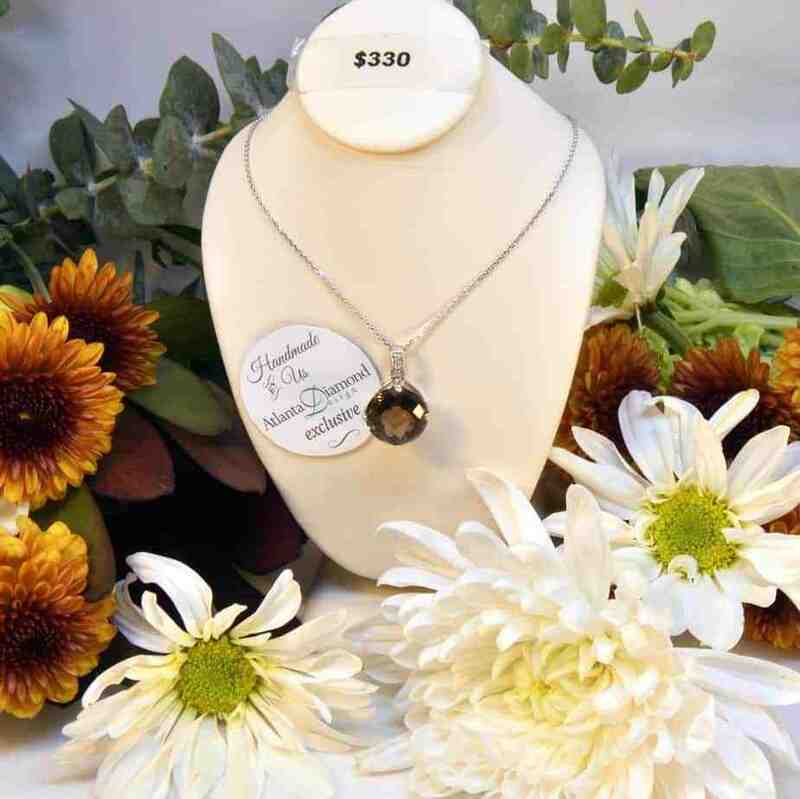 What a lot of people don’t know is that we design one-of-a-kind jewelry for our showcases, as well. 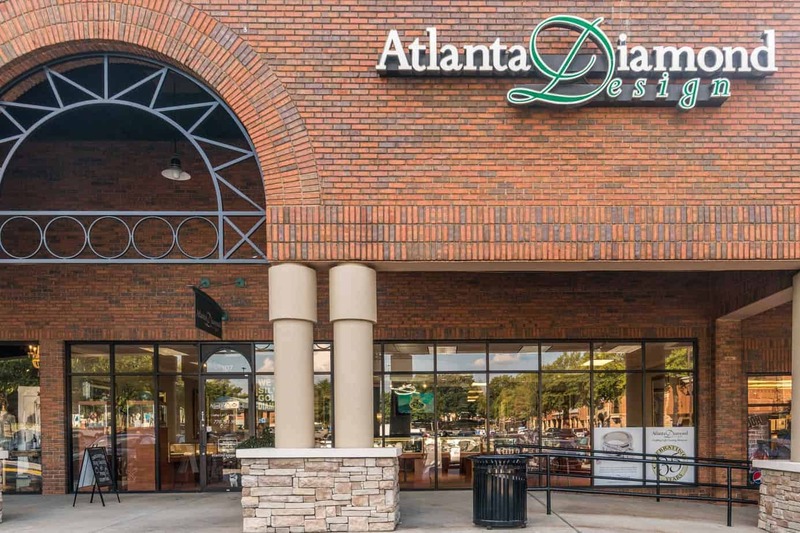 Here are a few of our spectacular creations. But we’re always in the middle of creating something unique, so keep posted for the latest beauties. Click on the image to enlarge. 14k white gold .70 cttw diamond by the inch, 18" necklace. $895. 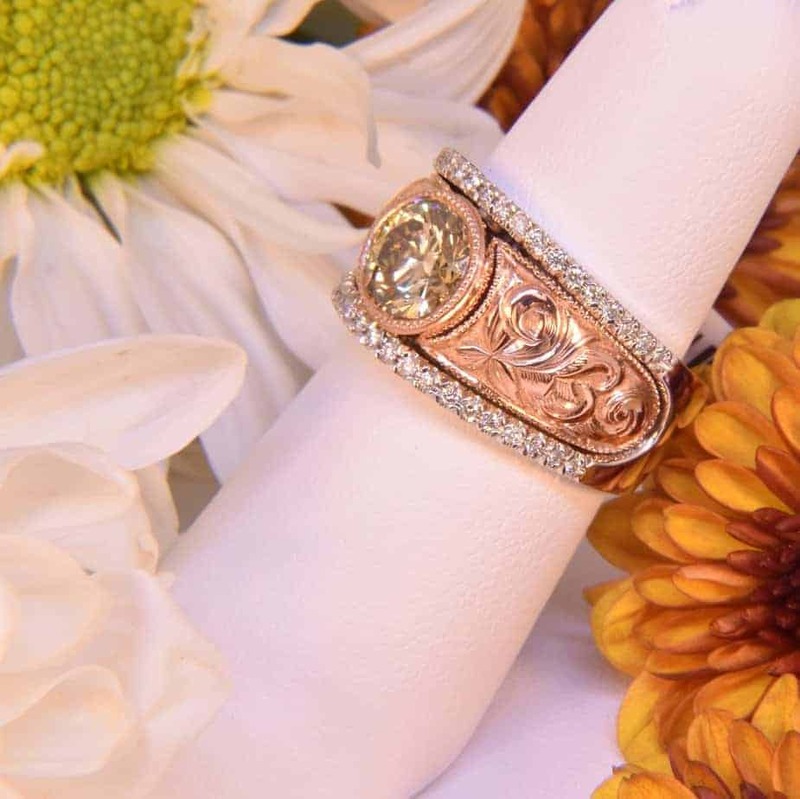 14k white & rose gold hand-engraved cigar band ring with 1.82 ct vivid yellow diamond and 40 SI1-SI2 G/H white diamonds of .20 cttw. $10,000. 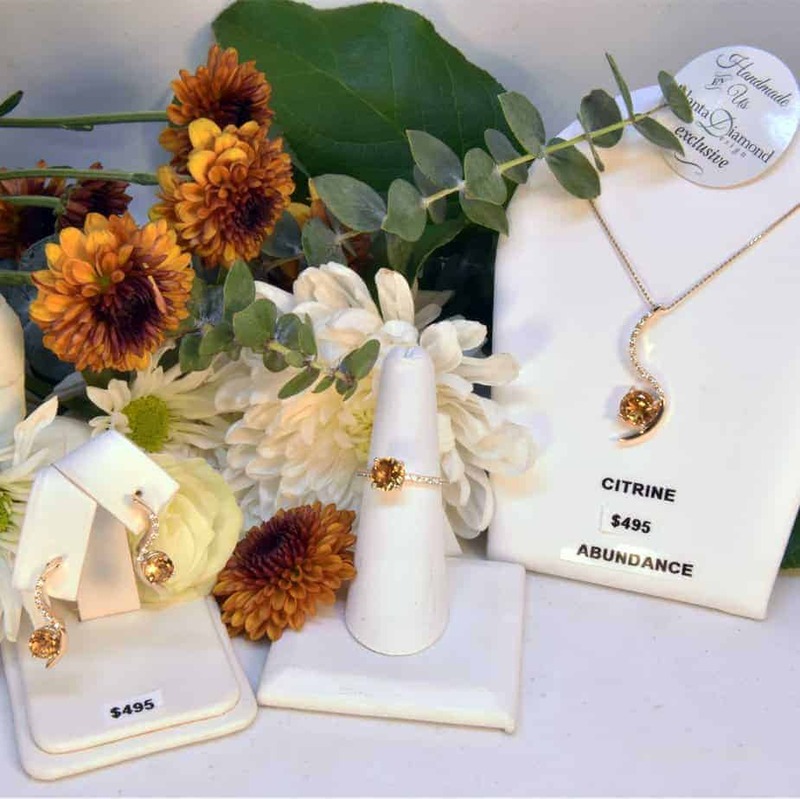 14k yellow gold citrine & diamond set. 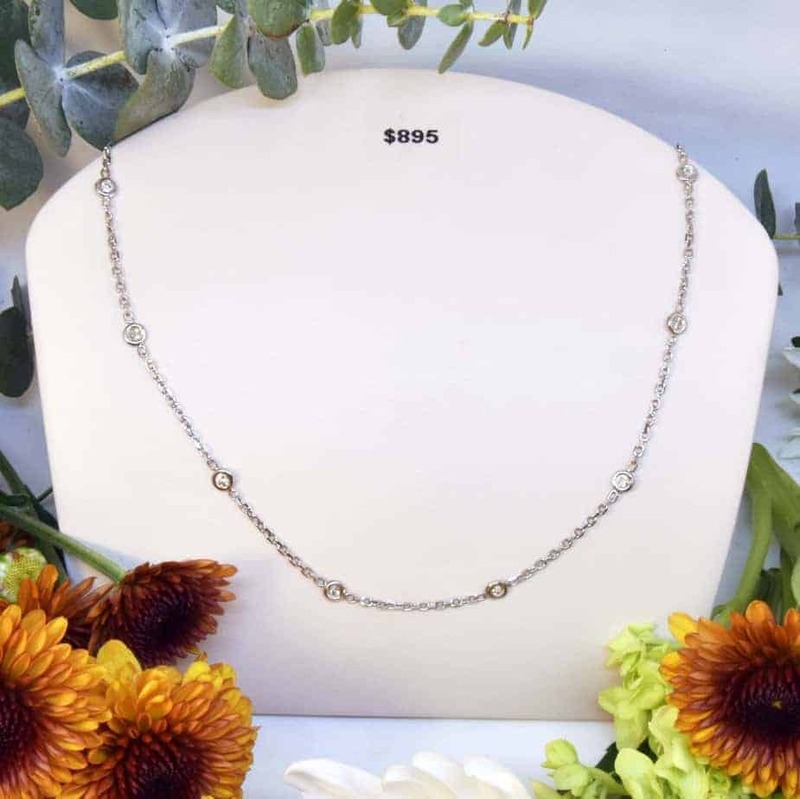 Necklace: 3 ct round citrine with .10 cttw SI1 G-H diamonds. $495 includes chain. Ring: 1 ct citrine with .22 cttw SI1-SI2 G/H diamond melee. $895. Earrings: 2 cttw citrines & .06 cttw SI1-SI2 G/H diamond melee. $495. 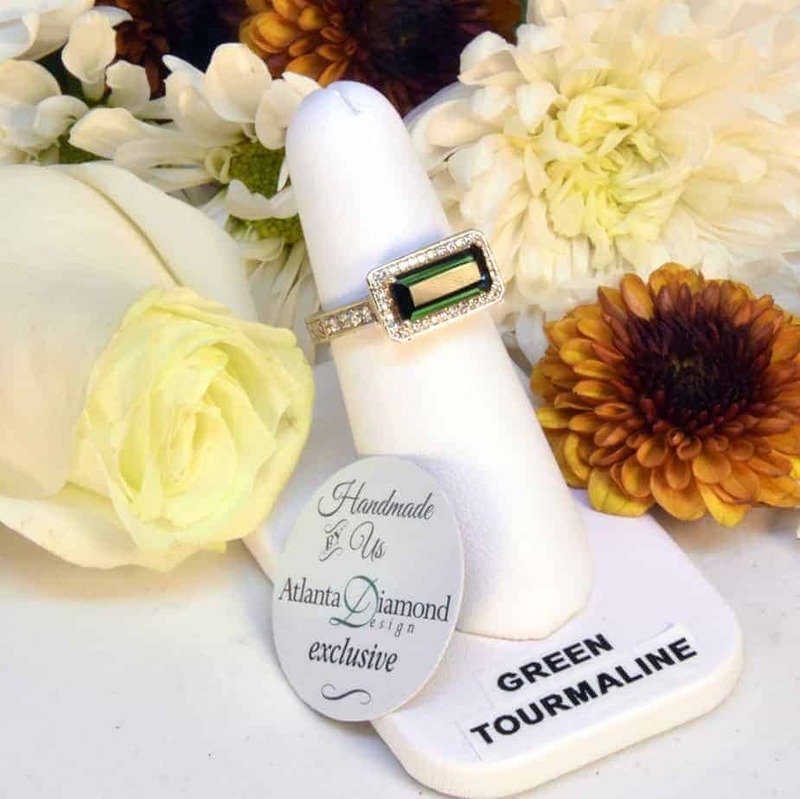 14k white gold ring with .75 ct VS1 F emerald-cut diamond center stone and 16 diamonds of .08 cttw SI1-SI2 G-H melee. $2450. 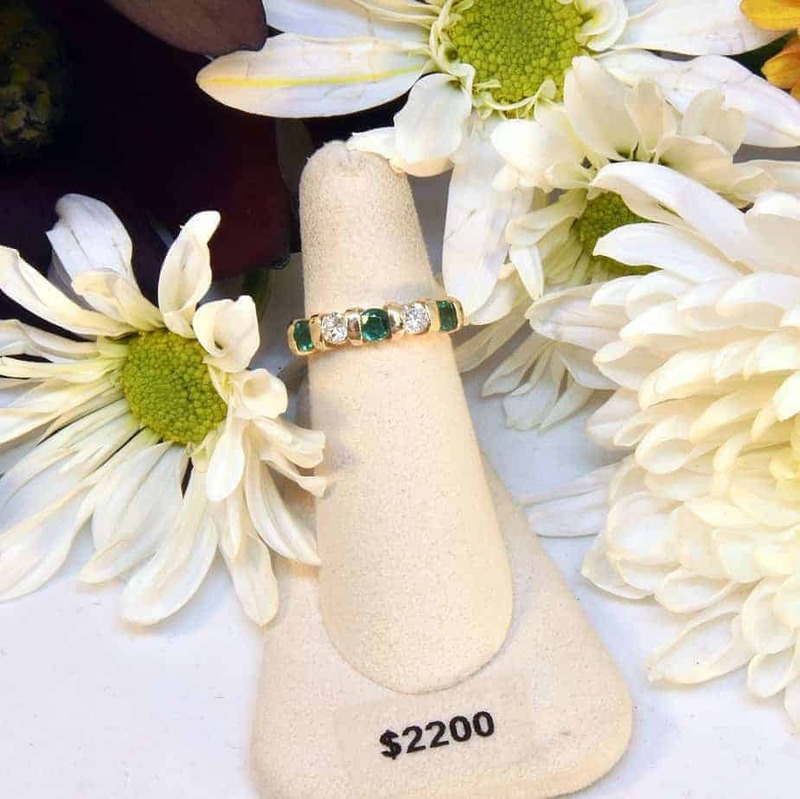 14k white gold hand-engraved ring featuring a 2.5 ct green tourmaline center stone and .33 cttw diamond melee. $1950. 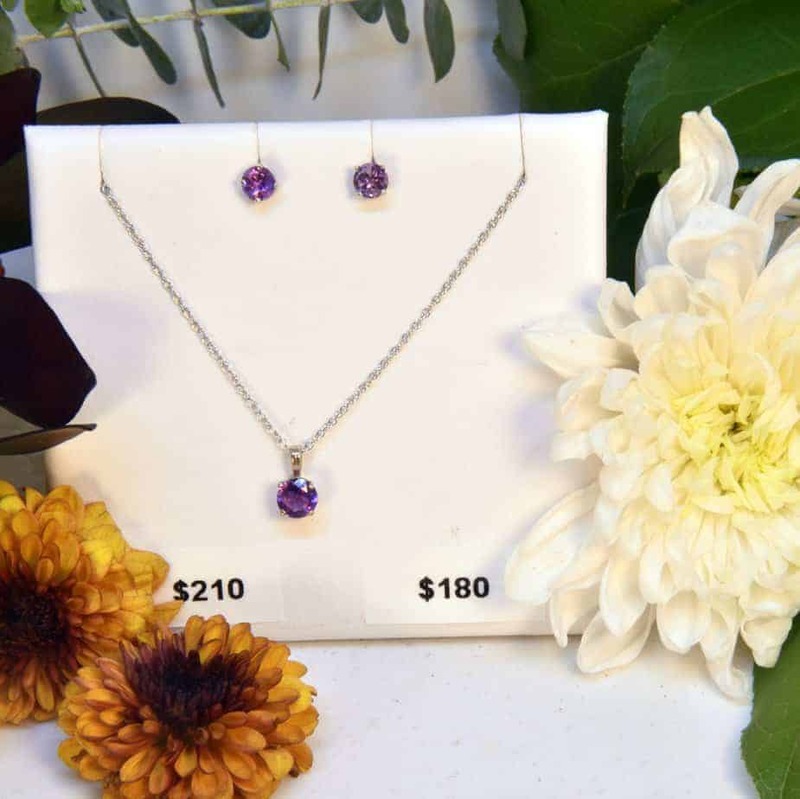 14k white gold solitaire amethyst set. 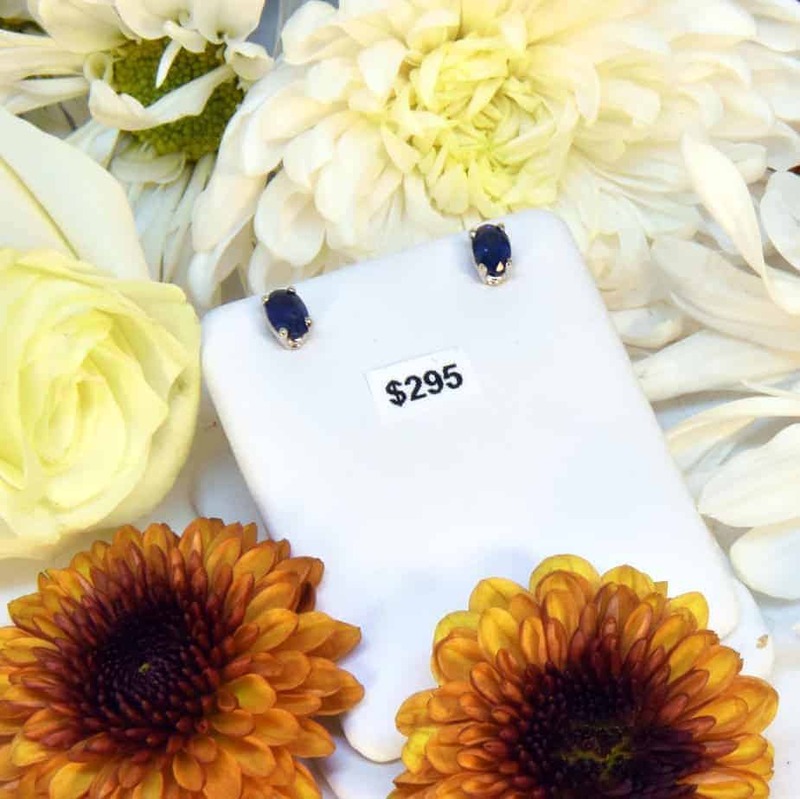 Earrings: $180. Necklace: .5 ct amethyst with chain. $210. 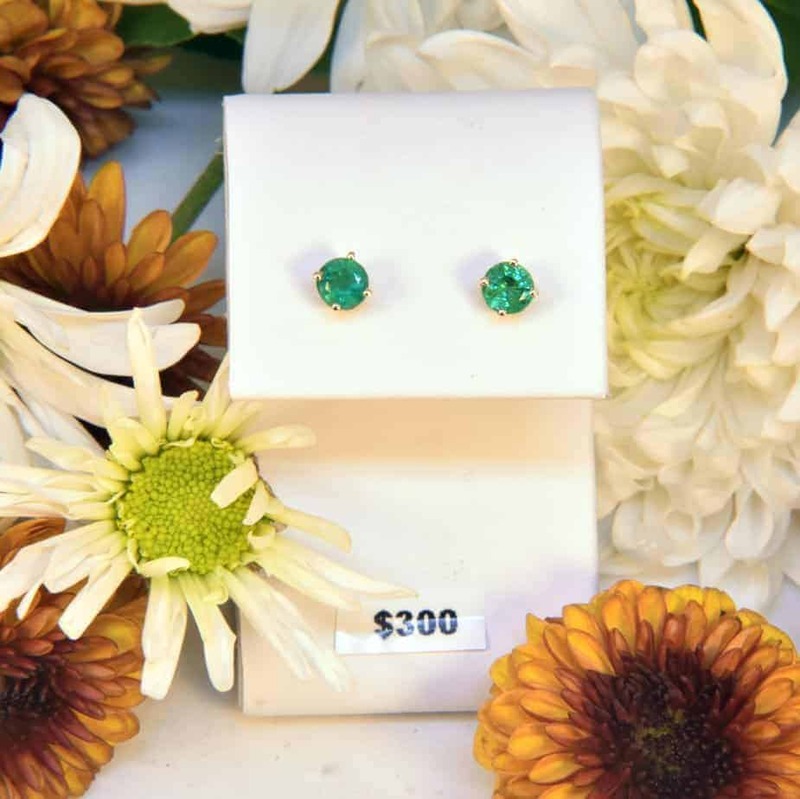 14k yellow gold genuine .98 cttw emerald stud earrings. $300. 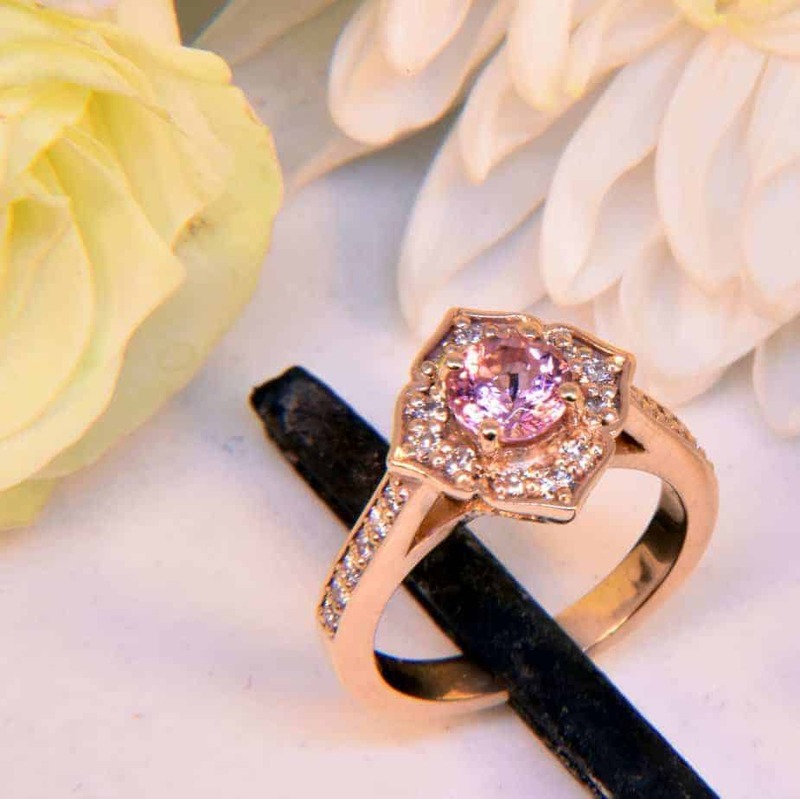 14k rose gold ring featuring .88 ct pink tourmaline center stone and .26 cttw VS2-SI1 G-H melee diamonds. $1250. 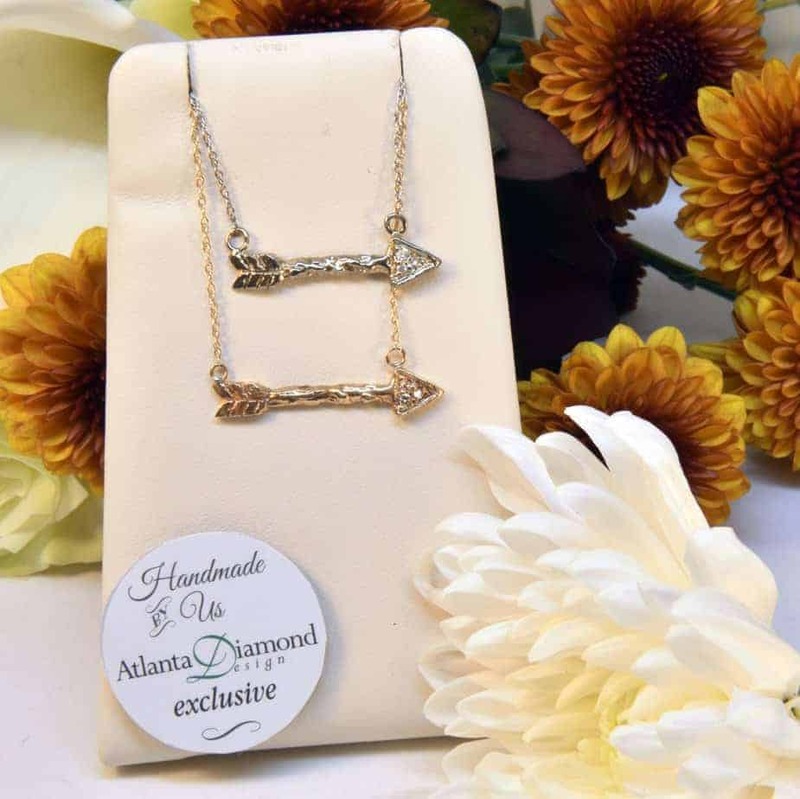 14k gold Loving Arrow Necklace featuring 3 melee diamonds of .03 cttw. Available in white, yellow, and rose gold. $349. 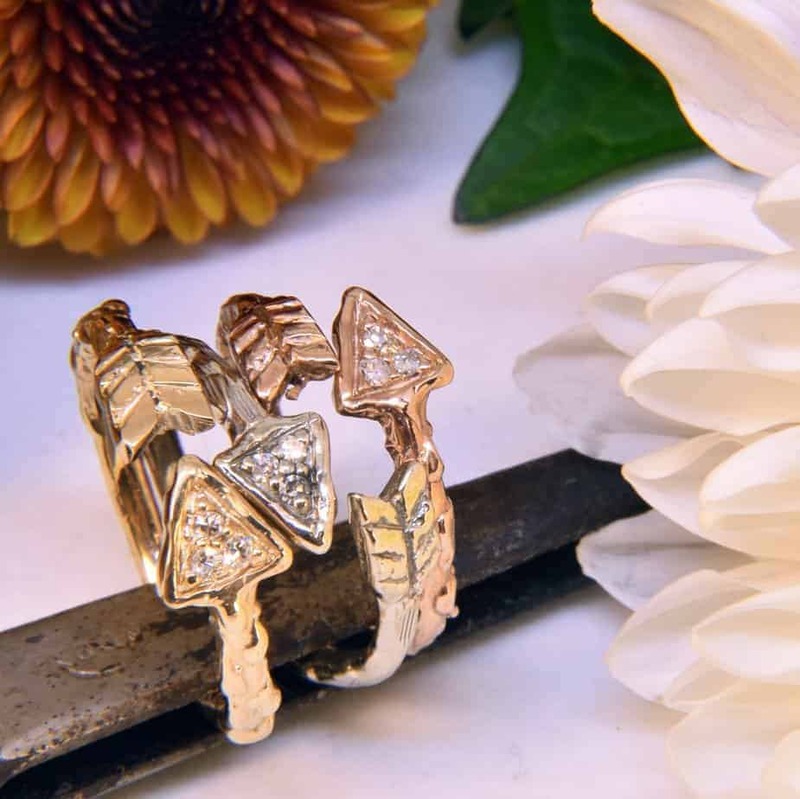 14k gold loving arrow ring with 3 diamonds of .09 cttw. $349. 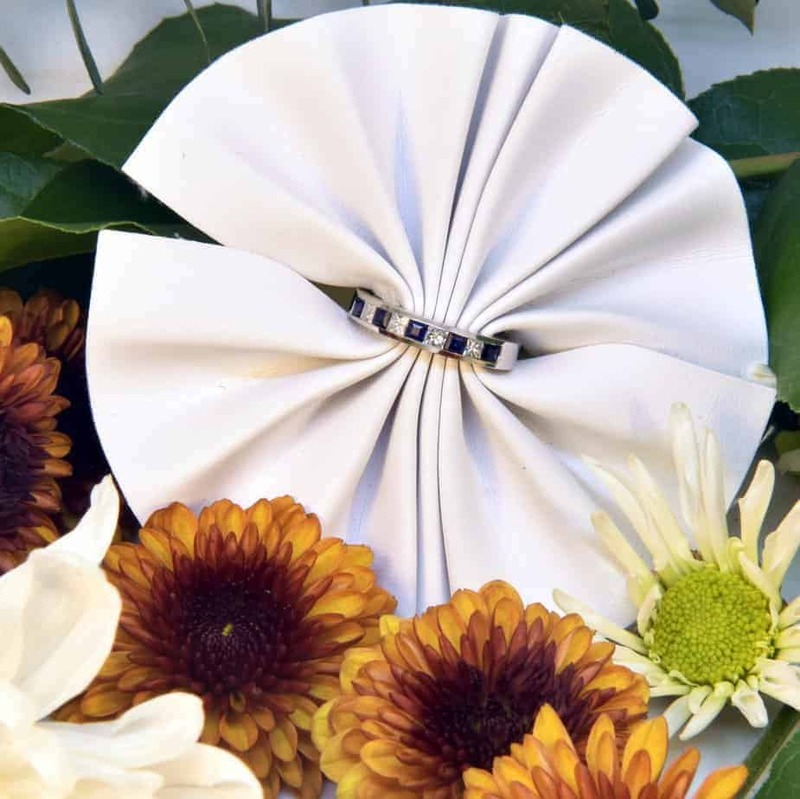 Available in white, yellow, or rose gold. 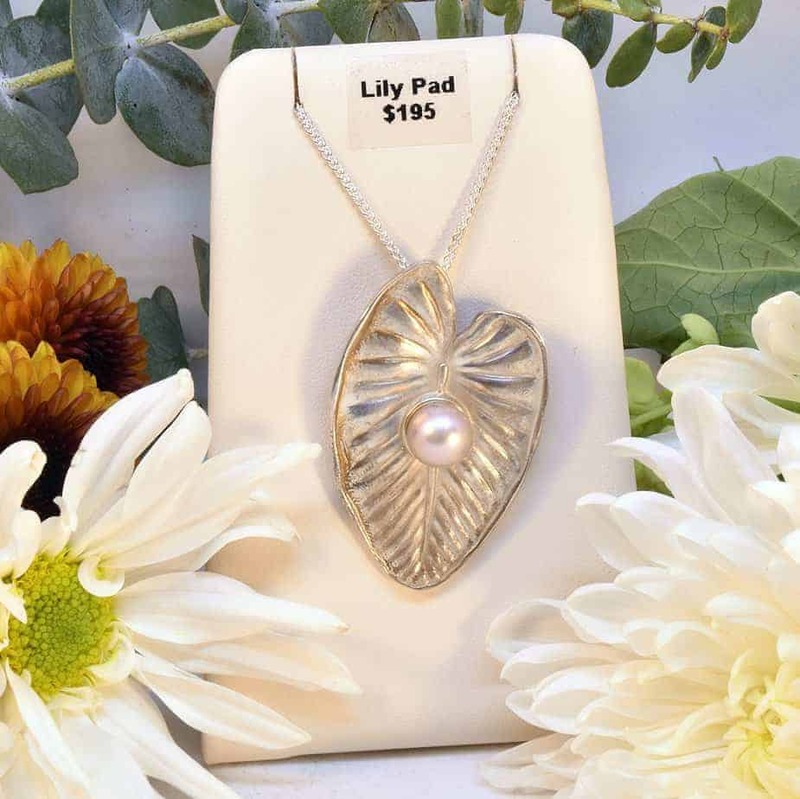 Sterling silver lily pad pendant with freshwater pink pearl. $195 includes chain. 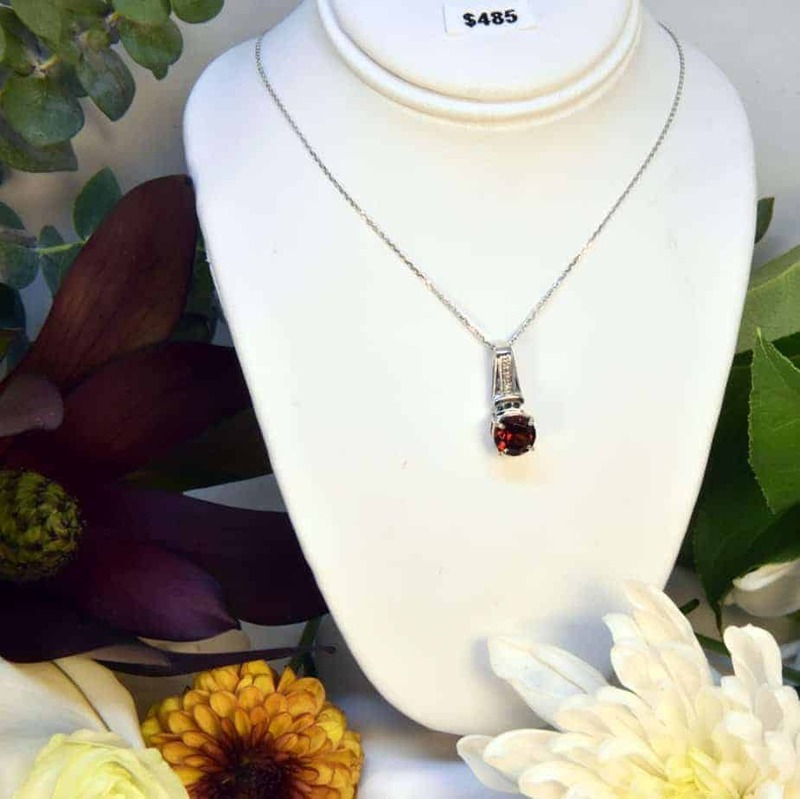 14k white gold pendant featuring a 1.5 ct garnet with .03 cttw melee diamonds. $485 includes chain. 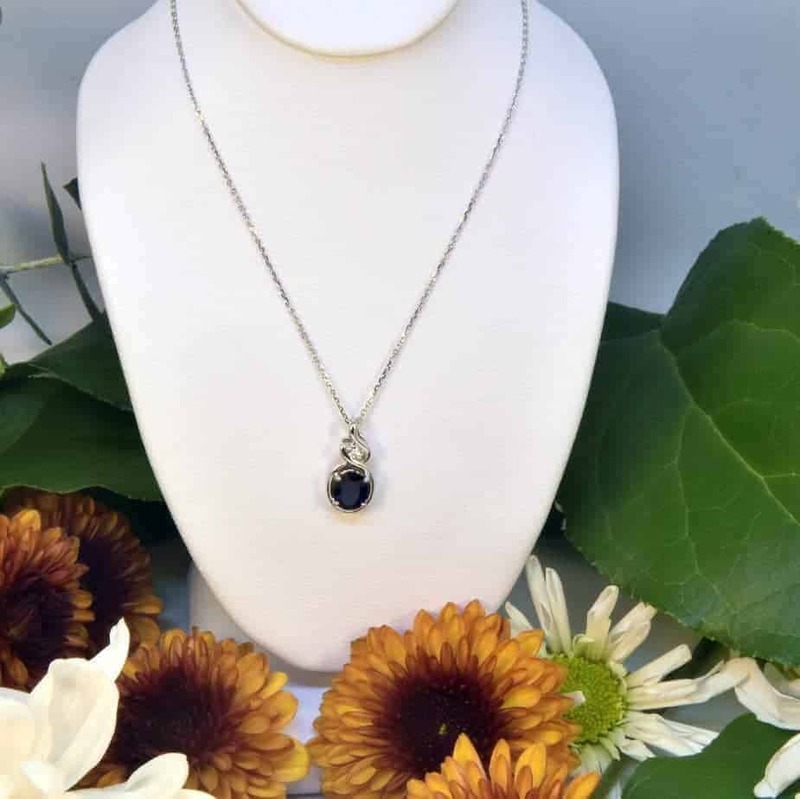 14k white gold pendant featuring a 1.5 ct oval sapphire with a .02 ct dewdrop accent diamond. $479 includes chain. 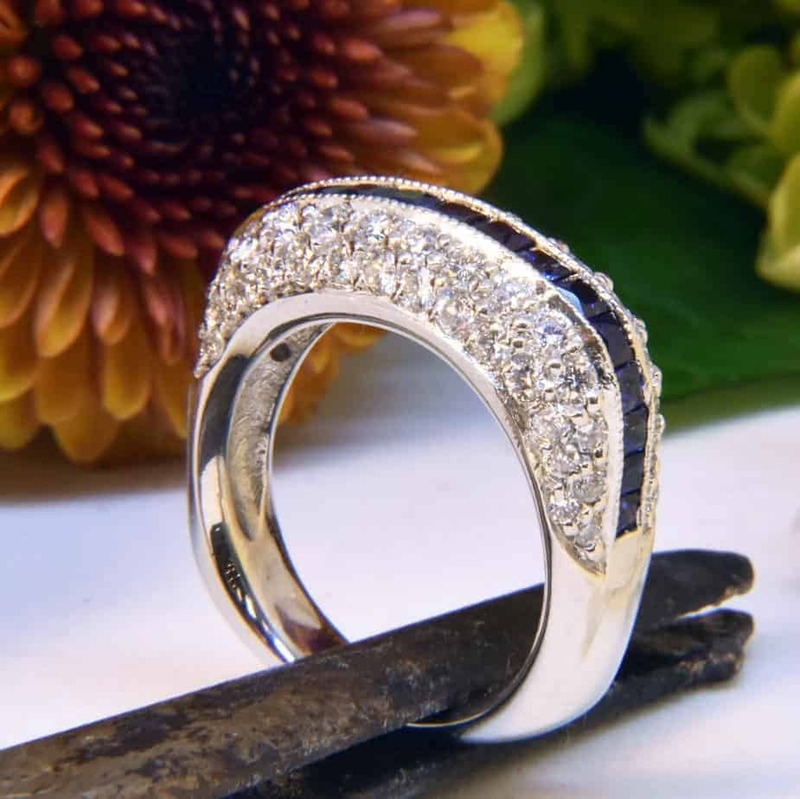 14k white gold band ring featuring 3 oval rubies of 1 cttw set in yellow gold and .50 cttw melee diamonds. $3499. 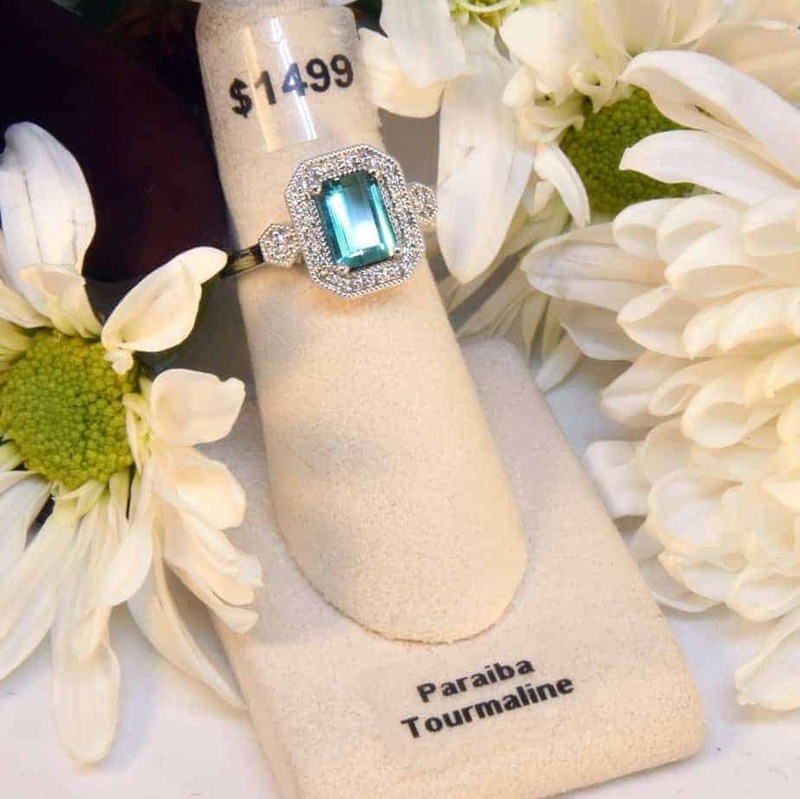 14k white gold ring featuring a 3 ct paraiba tourmaline and .33cttw SI1-SI2 G/H diamond melee. $1499. 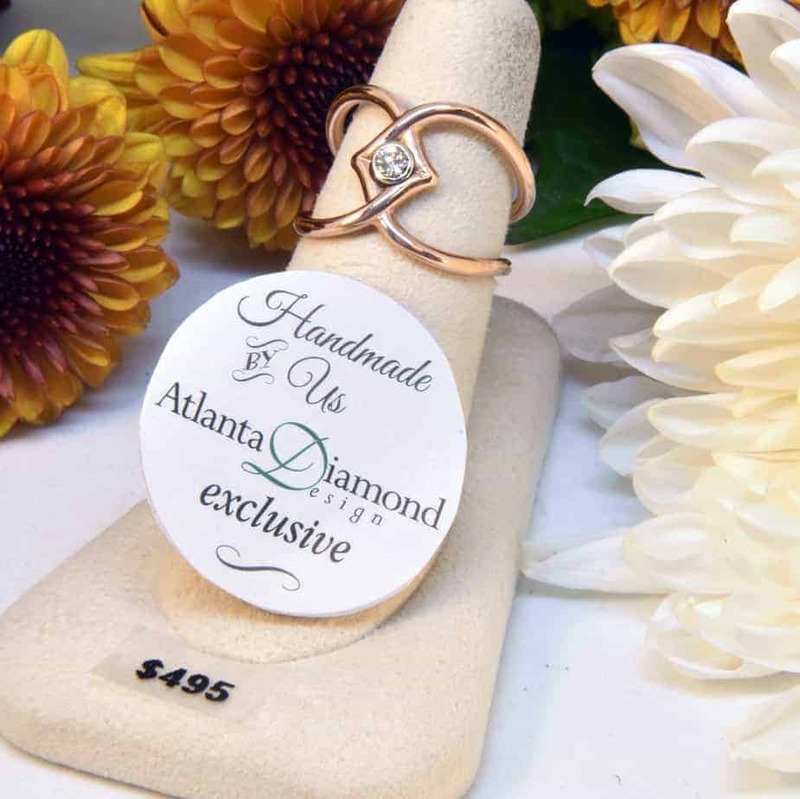 14k rose gold intertwined negative space ring featuring a .10 ct I1 H diamond set in a white gold bezel. $495. 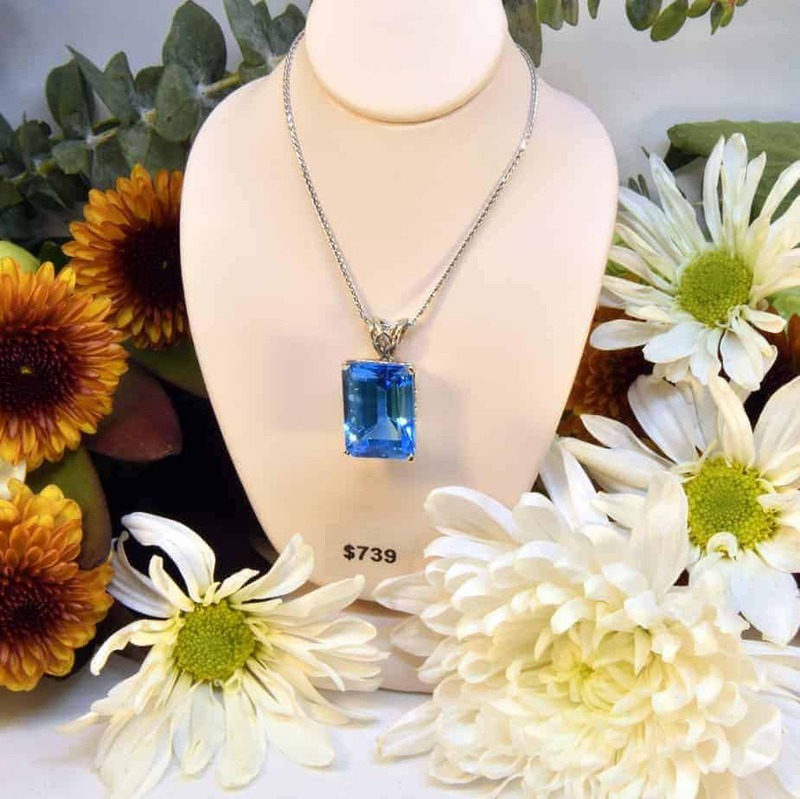 14k white gold emerald-cut 20ct blue topaz pendant. $739 includes chain. 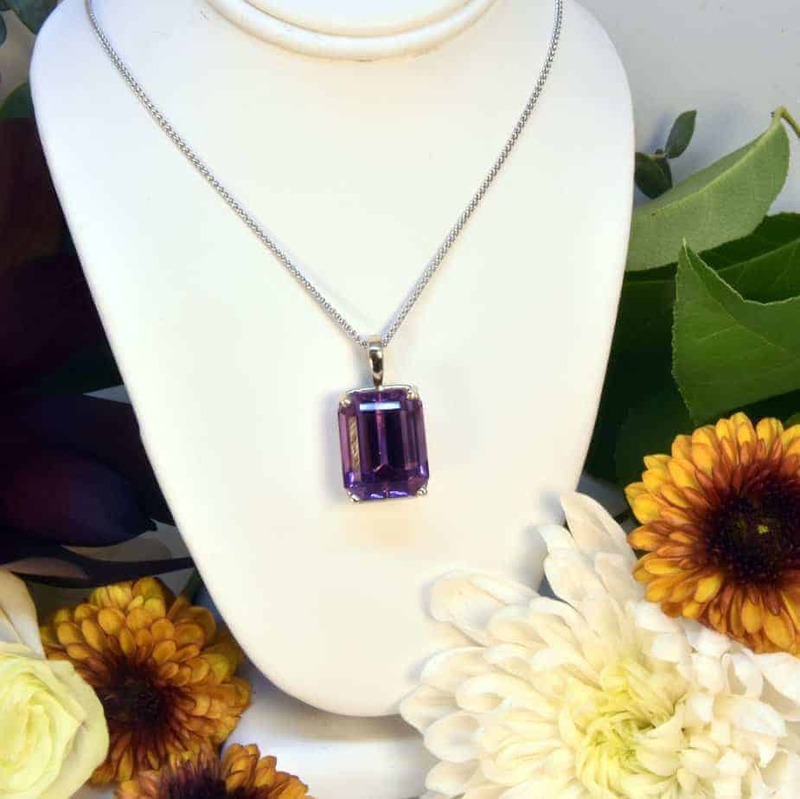 14k white gold pendant featuring a 14.45 carat octagonal emerald-cut amethyst. $625 includes chain. 14k white gold 1.5 cttw oval sapphire stud earrings. $295. 14k white gold eternity bangle featuring 2 cttw princess sapphires and 1cttw SI1-SI2 H princess diamonds. $2500. 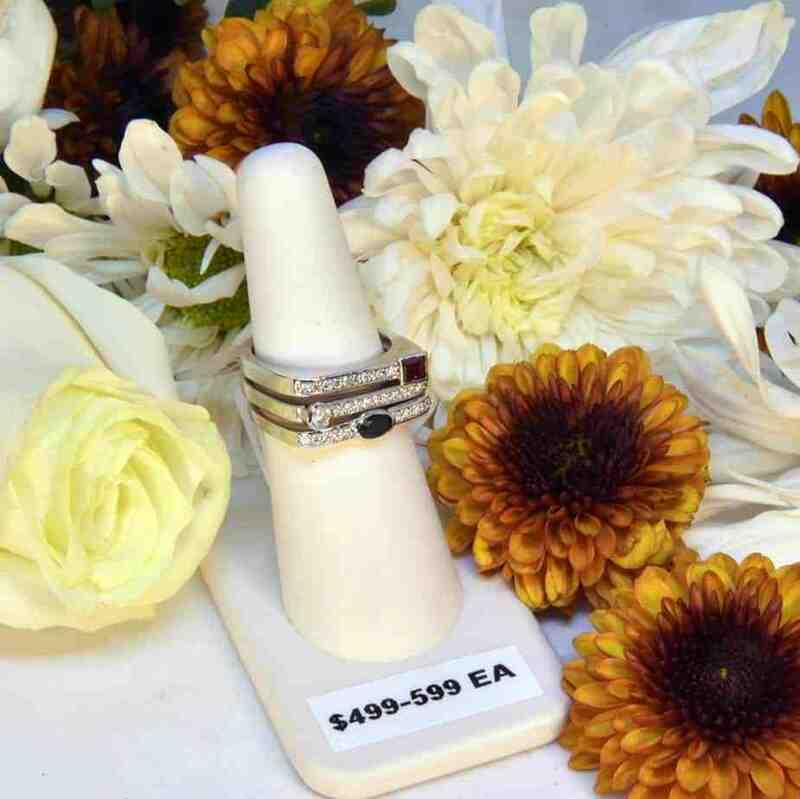 14k white gold stackable rings. 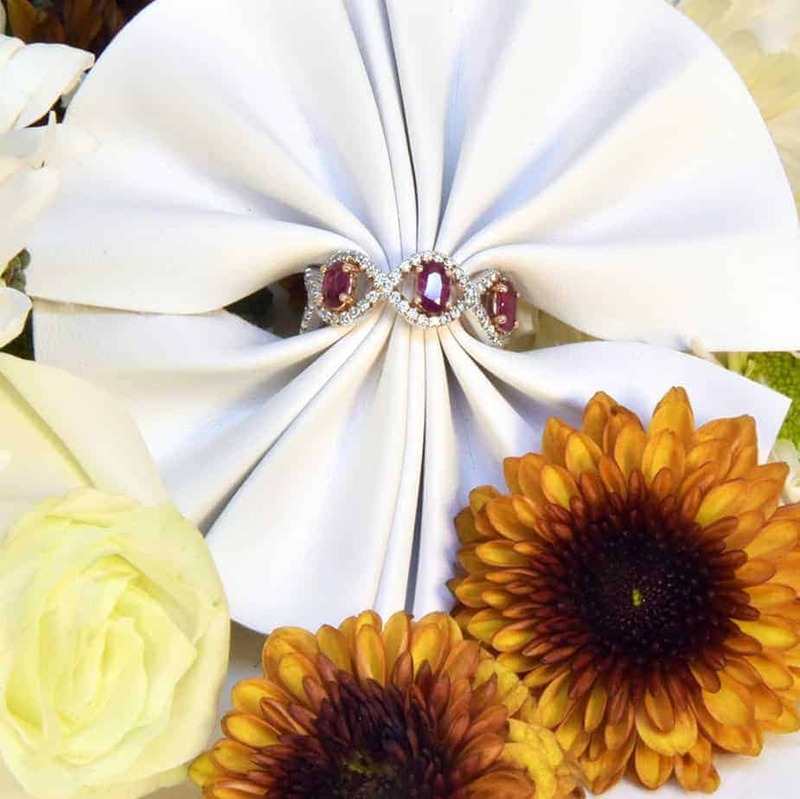 Top: .25 ct princess ruby and .05 cttw SI1-SI2 G/H melee diamonds. $499. 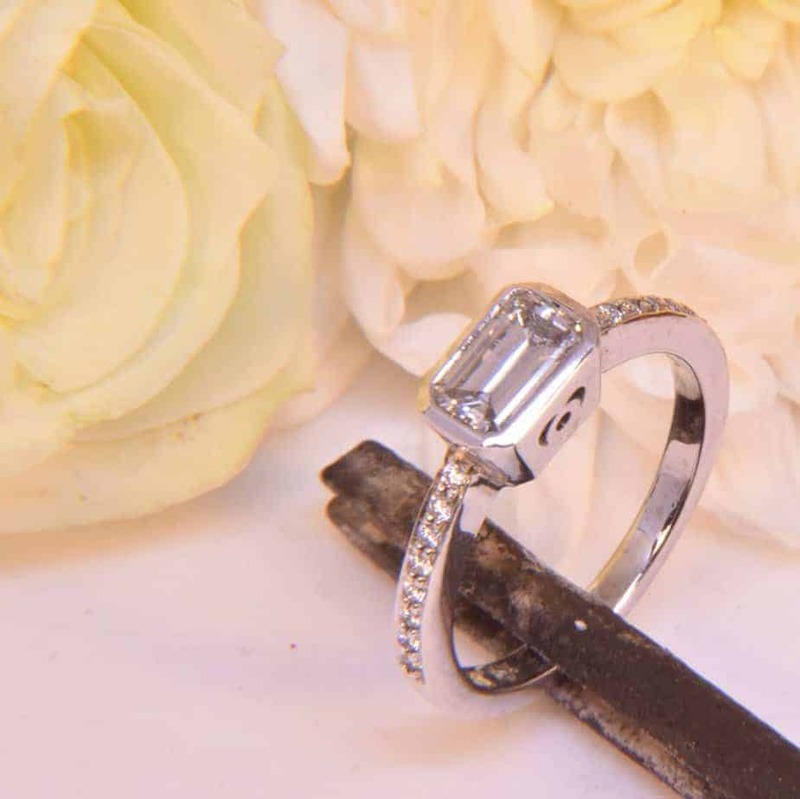 Middle: .10 ct SI1 H diamond with .10 cttw SI1-SI2 G/H melee diamonds. $599. Bottom: oval sapphire with .05 cttw SI1-SI2 G/H melee diamonds. $499. 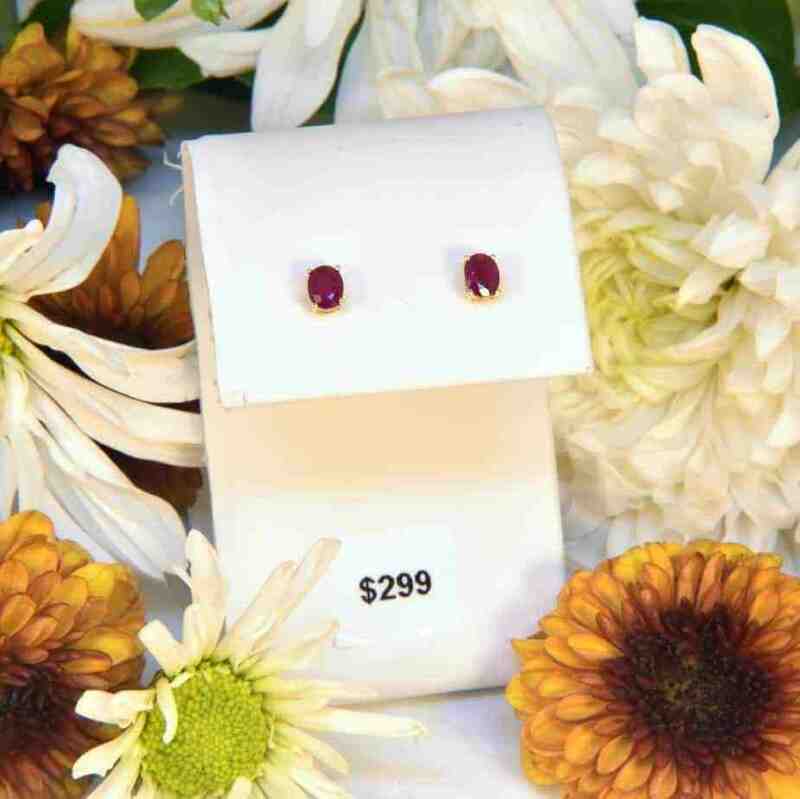 14k yellow gold 1 cttw oval ruby stud earrings. $299. 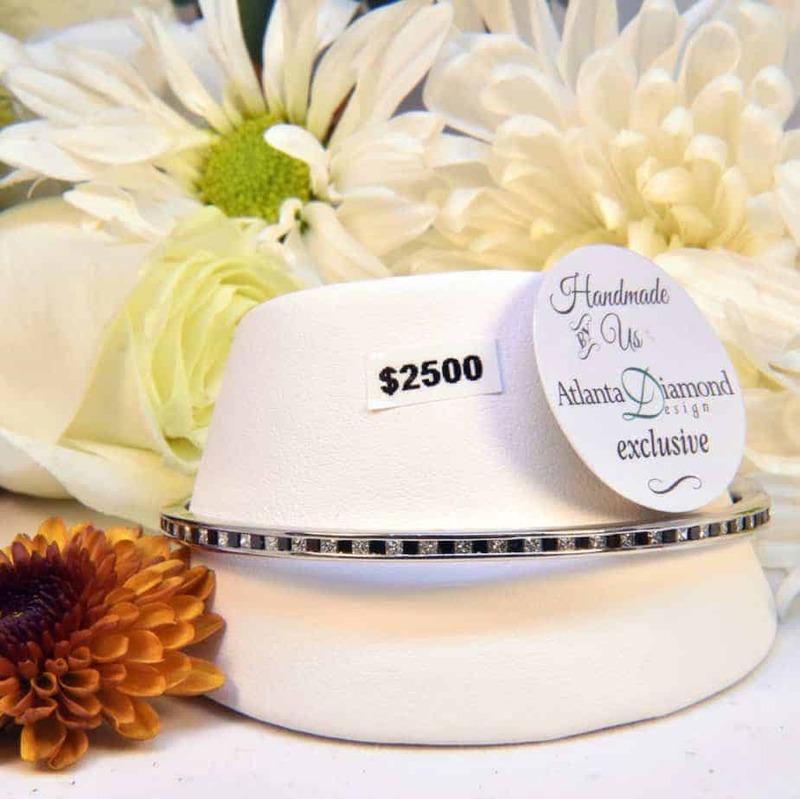 Platinum band featuring 1 cttw of princess-cut sapphires and 1 cttw VS2-SI1 F/G diamond melee. $5490. 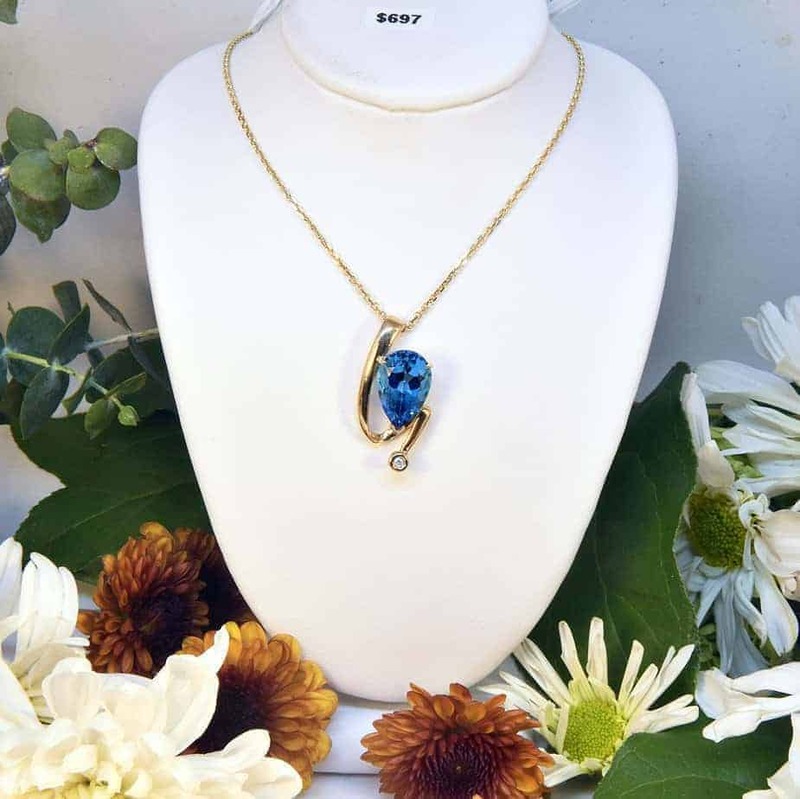 14k yellow gold slide pendant featuring a 10 ct pear-shaped blue topaz and a .10 ct SI2 H diamond. $697 includes chain. 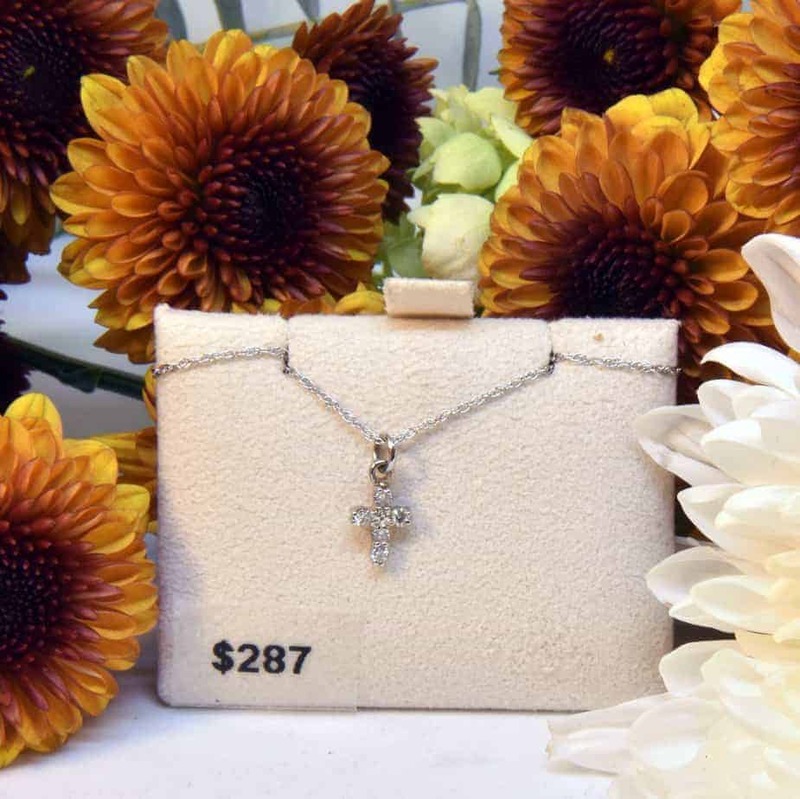 14k white gold tiny cross featuring .12 cttw SI1-SI2 G diamonds. $287 includes chain. 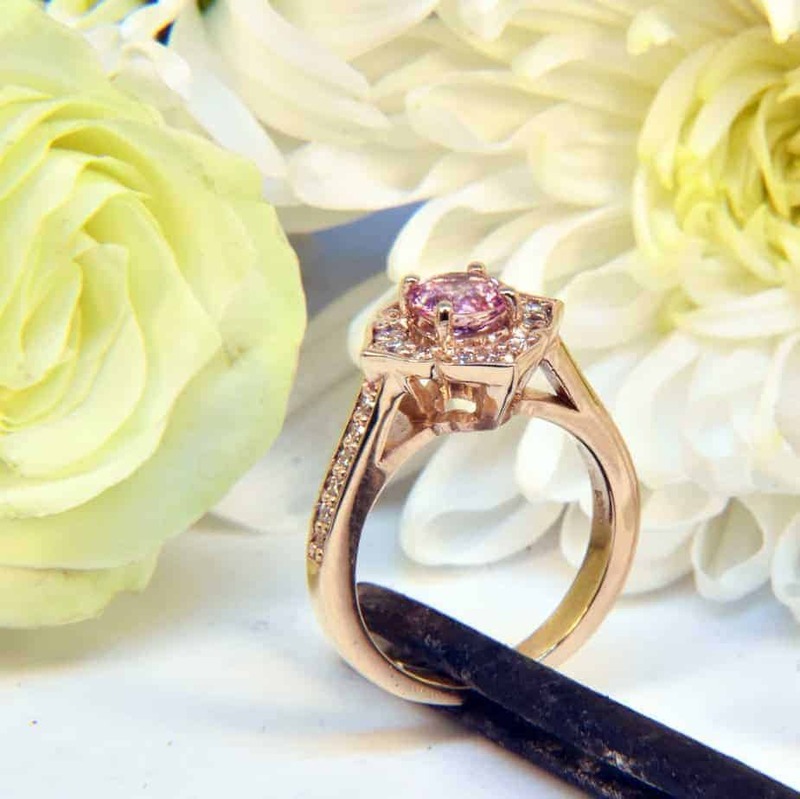 14k rose gold X rin, featuring .15 cttw SI1-SI2 G/H diamonds. $745. 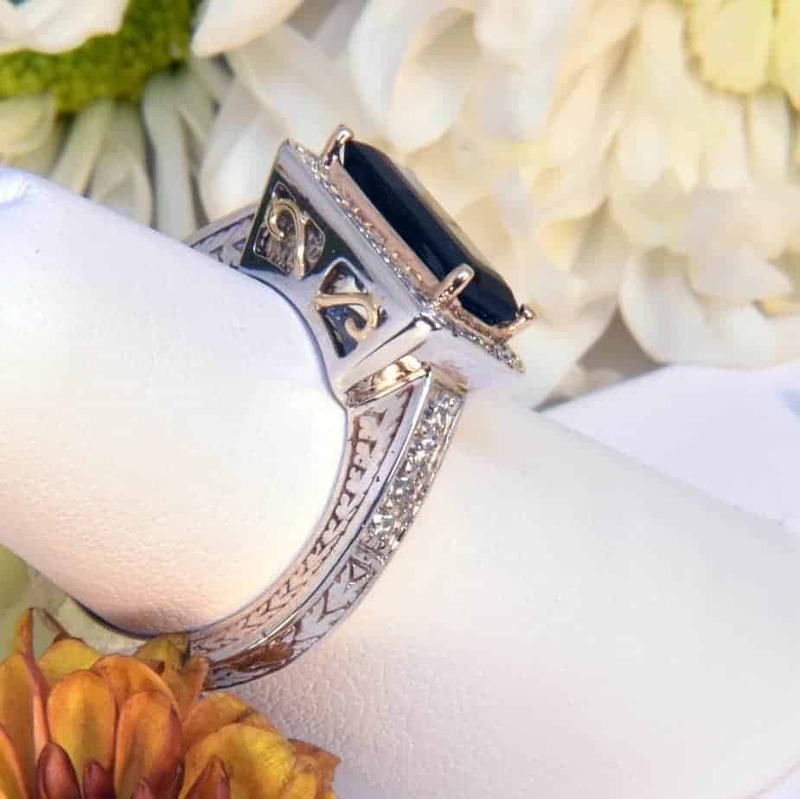 14k white gold pendant featurin a 7 ct checkerboard-cut smoky quartz and .03 cttw diamond melee. $195. 14k white gold 18" chain. $135. 14k white gold stud earrings featuring two 6×4 oval sapphires with dewdrop diamond accents. $499. 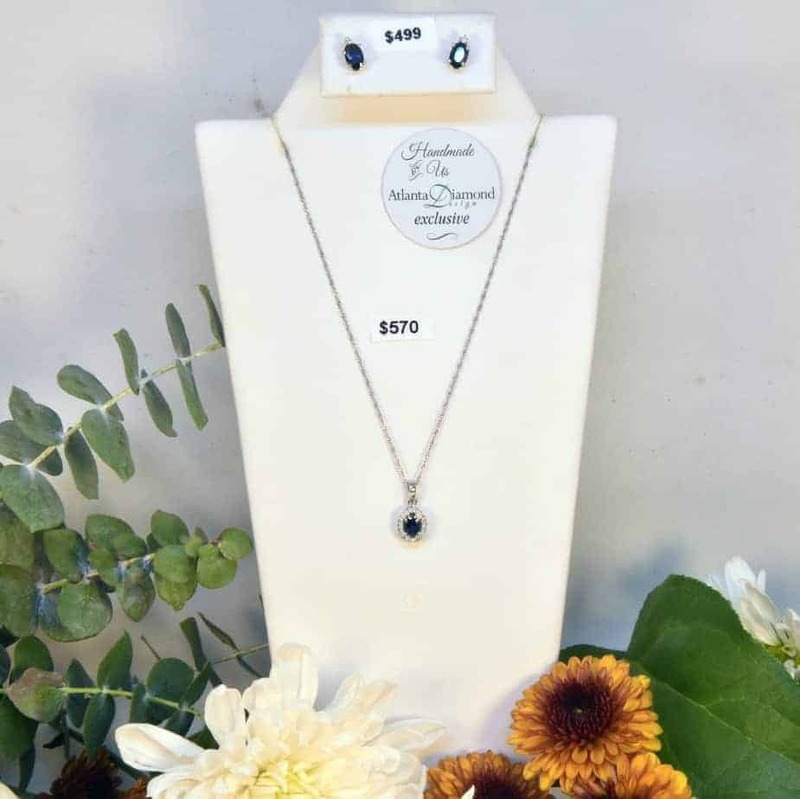 14k white gold necklace featuring a 1 ct oval sapphire with .10 cttw, 20-stone diamond halo. $570 includes chain. 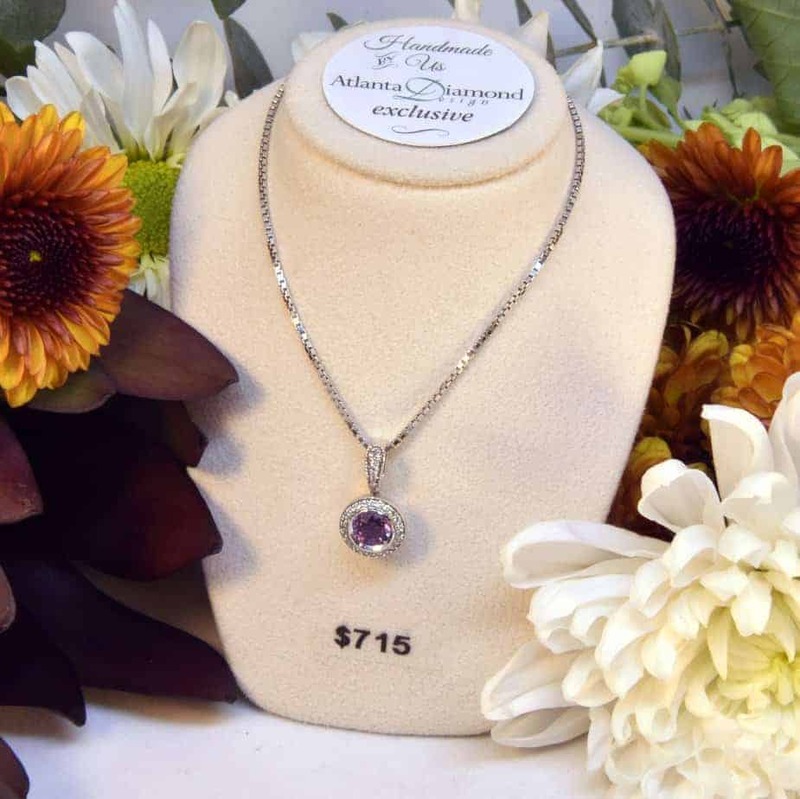 14k white gold pendant featuring a 1 ct amethyst and .15 cttw SI1 H diamond melee halo & bail. $715 includes chain. 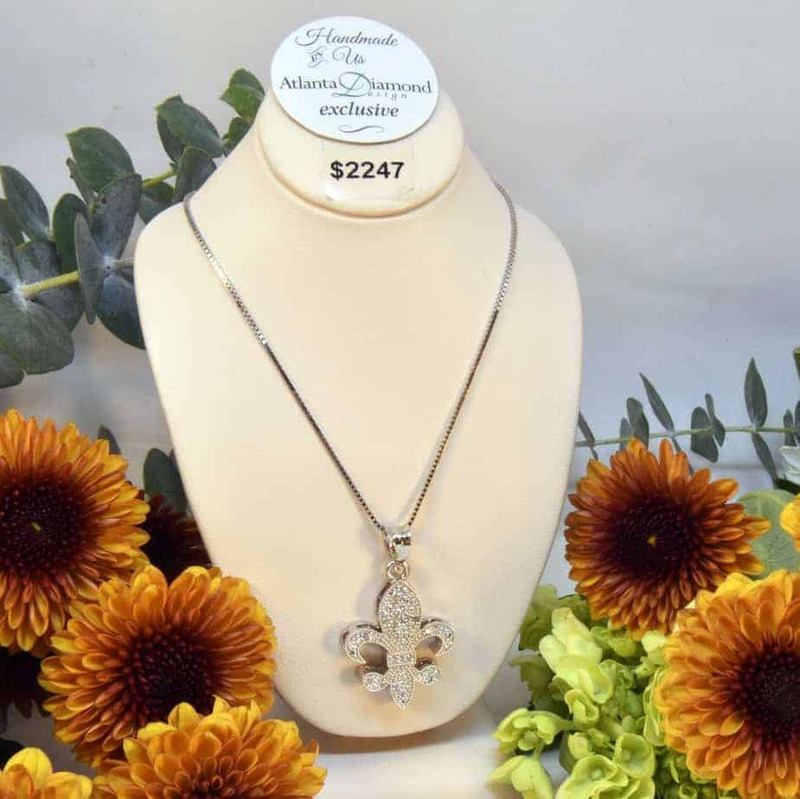 14k white gold fleur de lis pendant featuring .50 cttw SI1 H diamond melee. $2247 includes chain. 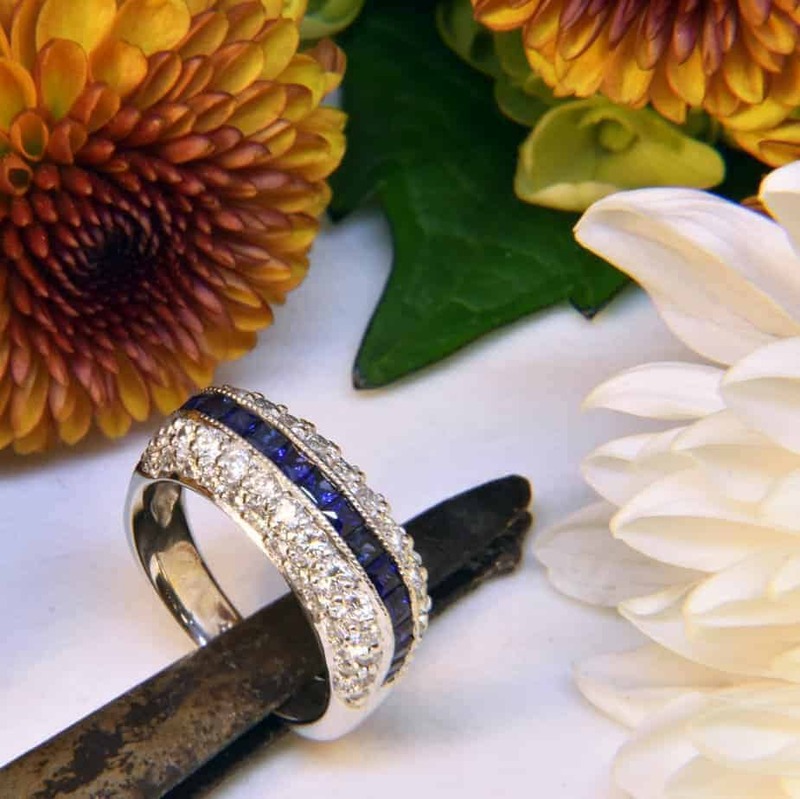 14k white gold anniversary band featuring .50 cttw sapphire and .22 cttw diamonds princess-cuts stones. $1200. 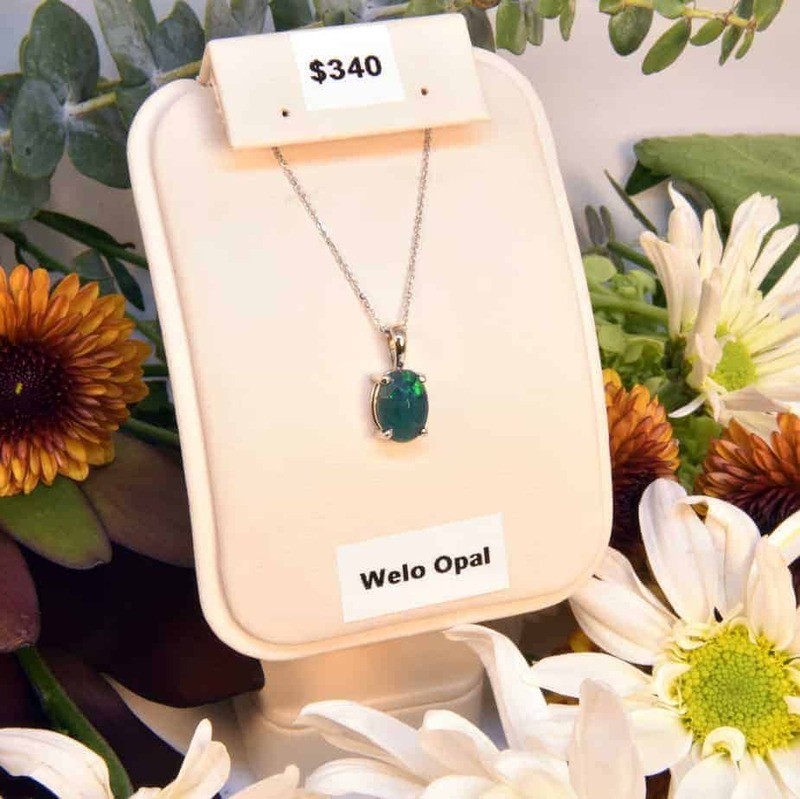 14k white gold pendant, featuring a 15×10 oval Welo opal with spectacular green flashes. $340 includes chain. 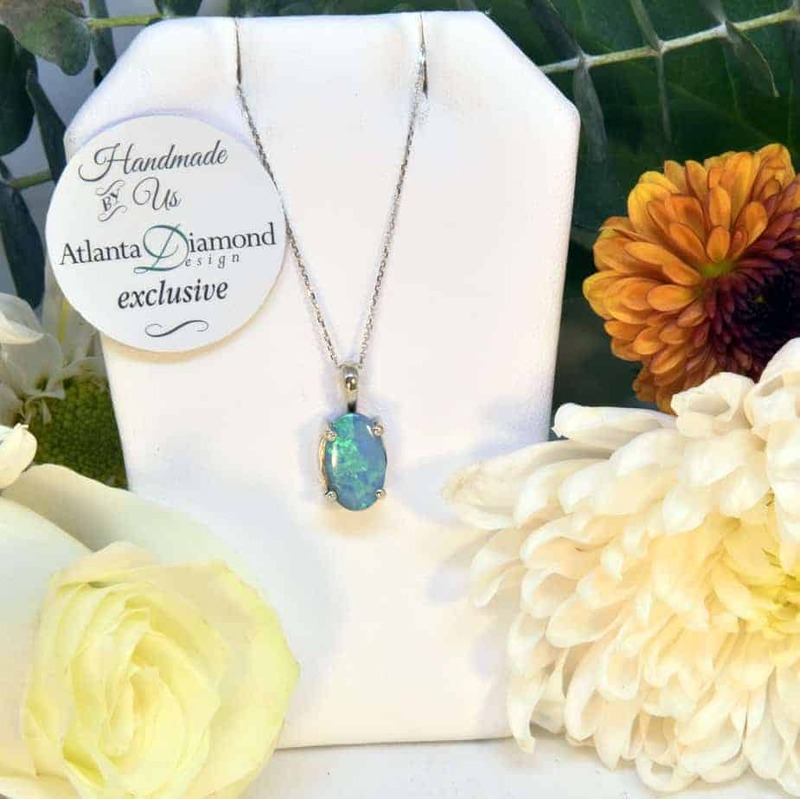 14k white gold pendant featuring a Boulder opal doublet with spectacular flashes of color. $585 includes chain. 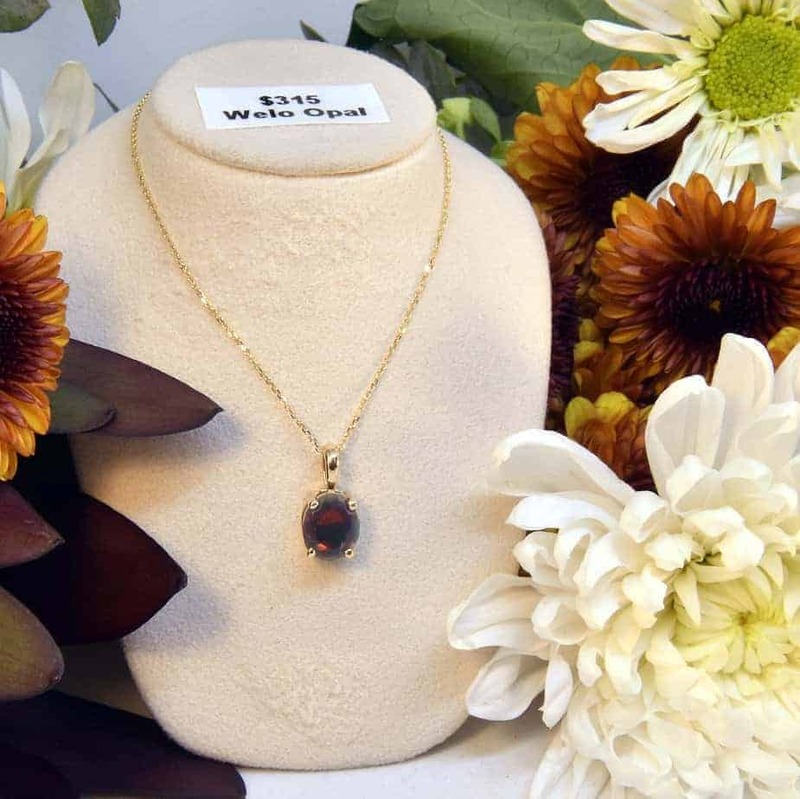 14k yellow gold pendant featuring a Welo opal with spectacular red flashes of color. $315 includes chain.